Daily Illuminator: Perfect For Drinking Shots . . .
April 3, 2011: Perfect For Drinking Shots . . . While they do make a nifty container for Cthulhu Dice marbles -- the glass holds exactly 18! -- I don't recommend putting them near your "I'll do anything for a buck" friend. As long as he didn't chew, I'm sure he could swallow the glass beads whole, but the choking hazard is pretty obvious. Plus you could spill your beads, and that would be messy. 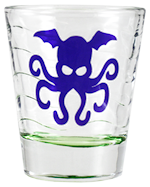 Whatever you plan to use the Cthulhu Shot Glass for, be aware that we have a limited number of them, and that they're only available from Warehouse 23. Get your order in today!